Here is my contribution to the annual Holiday Open house at my friend Deb's , for next weekend. This is where I begin to lay everything out, and give it one last look, before I pack it all away. I put new shelving up to display my crafts, and I wish I could just leave it all there......oh well. Candles are painted, and rosehips secure (thank's for the Modge Podge tip Deb! Awesome!) The cello paper gives it a nice sparkle, finished off with a homespun tie. I know, Halloween is over, but some folks like this kind of stuff all year. Mini Raggedy Annie Makedo's and whimsey pumpkin heads too! 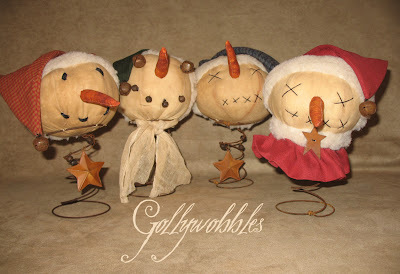 We musn't forget the Snowmen collectors! What are they all looking at???? A mini collection from Grungy to cute. These dolls originally both had blonde hair. Then I remembered these 2 gals that came to the Collector's Eye Fall Festival. They each bought an angel doll because one had blonde hair, and one had dark hair. They enjoy purchasing similar things when they are together. Well, I remembered that Deb sent them an invite, and I thought I would change one doll to dark hair. I'm so wicked sometimes! Well, everything is counted for in my inventory list. All items are tagged and put away. Now all I have to do is bake some brownies, and deliver in the next couple days. Next week, I will show pictures from the open house. I'm am sooooooooo ready. Maybe I'll manage to squeeze in another project before then...... I did say maybe! See you next week! the spindles I've had laying around. that I've been working on. and a big deadline for next weekend. what ever else I manage to finish. and pip berries in Barn Red, and Gamal Green. with stuffing and sewing the makedos. from making my dolls grungy! grindstone with making more dolls! Oh the joys of having a day off from work! I have 3 more days to play! and I'm going to be ready! of two best friends who agree to disagree. Golly thinks the stronger the scent, the better! and Polly is most definitely NOT. But their friendship has endured their differences over the years in a way, that really makes them more alike below the surface. Together they share strong values of love, devotion and loyalty to their family and friends. For fun, they LOVE to find tag sales, never in competition for the same item. (go figure!). Conversations, via phone, cards and e-mail, are about quality, not quantity. Days or months can pass, and without question, each new encounter is like no time has passed. on line, and promoting "prim" to the world. you have more than your share. I struggled however with the grungy look. I started with a stain concentrate that I sprayed on. It was blotchy, and not quite right. So I whipped up my stand by concoction of instant coffee, vanilla and cinnamon, and stained it again. It always matters if you are using Osnaberg or Muslin. 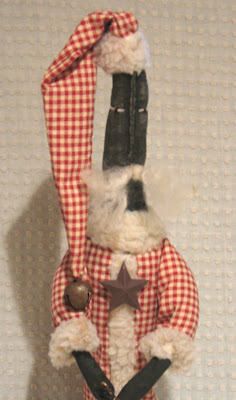 This santa is made of muslin. I actually have 15 bodies ready to be made into something. and not allow pressure on myself. Stand by....anything can be mounted on these spindles. My dear boyfriend cut the square bases for me. They are so perfect for stabilizing. 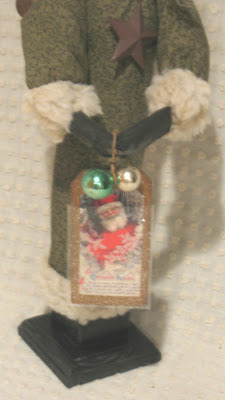 Hopefully this Santa will be listed on eBay over the weekend. My final evaluation is that I actually like him. I hope you do too! This is my last project of the night. Ready or not, the fair is tomorrow! I had 6 heads started, but decided to call it quits after finishing 4! I have a holiday fair the first weekend in December, so I'll save them. I can see how these heads do first. Heck, maybe they won't sell at all, and I won't have to worry about it. I need to spruce up my site on Grapevine Hollow, so you might see these fella's there after the weekend! LOL! I actually started out with a Sassafrass Hill Primitives pattern, but I'm terrible when it comes to following directions. I just get lost in my own little world, and I end up with something totally different. I have a tendencay to "go with the flow"! I was a little irritated while working on these. Nothing felt like it was going right. The heads were top heavy on the springs, and I had a hard time securing the head to the springs. I like the end results though, and now everying is packed. I just have to bring it out to the car in the morning. I saw red skies at sunset, which is usually a fisherman's delight. Red Sky at morning, Sailor's take warning! But I keep hearing we will get some heavy rains from the hurricane moving north. I'm sure that is the case, since we have a craft fair tomorrow. Do you suppose the folks will say in? I know I would want to stay in on a rainy day. ( my favorite crafting weather! ) But some folks get depressed staying in, and just go shopping or whatever. Hope that is the case tomorrow! Well I better hit the sack. I'll get an easy 6 hours of sleep at least.